This week is Brain Injury Awareness Week. At the First Peoples Disability Network we say that meeting the needs of Aboriginal people with disabilities is one of the most critical social justice issues in Australia. It is difficult to think of any more disadvantaged Australians then Aboriginal people with disability. FPDN co-hosted a forum in Redfern with Synapse and we hope to draw attention to the unmet needs of Aboriginal people living with brain injury. According to the 2011 Census at least 50% of our people have some form of disability or long term health condition, the 2014/15 Aboriginal and Torres Strait Islander Social Survey has concluded that at least 7.7% of all Aboriginal and Torres Strait Islander people have severe or profound disability, this equates to approximately 60,000 Aboriginal and Torres Strait people with disability who are eligible for the National Disability Insurance Scheme. The actual prevalence of brain injury in Aboriginal and Torres Strait Islander communities is not known but we could be sure that the rate is at least twice that of the rest of the Australian population. Brain Injury can occur for a range of reasons. It might be the result of an accident, violence or as a consequence of alcohol or substance abuse. Regardless of the cause it is fair to say that the needs of vast majority of Aboriginal and Torres Strait Islander people living with brain injury remain largely unmet. Two leading researchers spoke to us and presented data and lessons learned through ongoing research. Professor Eileen Baldry has done some vital research into the prevalence of people with disability in the Australian prison system and Dr Clare Townsend shared with us the research she has done in relation to Aboriginal people with brain injury and homelessness in North Queensland. These research projects are culturally respectful and inclusive of Aboriginal researchers, organisations, Elders and Traditional Owners. At FPDN we are grateful to both Eileen and Clare for bringing their extensive research experience to this most critical social justice issue. It is vital that we work towards meeting the needs of Aboriginal people with disability including those Aboriginal people living with brain injury. The overwhelming messages that were raised in yesterday’s forum are ones often repeated among our mobs and at conferences and forums led by Aboriginal people. Listen to communities, invest in support, invest in communities – the financial and human costs of a punitive and overly policed society are far greater than whole of community responses to disability and disadvantage that we all advocate. The numbers back this up. There are huge costs to the wider community, and to the individual for that matter, when people cycle in and out of emergency services rather than ongoing and responsive supports from an early age. I’m reaching out to you today because we need people across the country to champion this issue. It is a national outrage that so many of our people are in prisons and that the rates are increasing. People with disability, including those with acquired brain injury have unmet needs, and too often disability is in effect criminalised. Aboriginal people with disability end up in prison or sleeping rough because they are rendered “invisible” by a system that does not respond to their needs. A responsive and supportive system would cost much less in both the human and ecomonic senses. 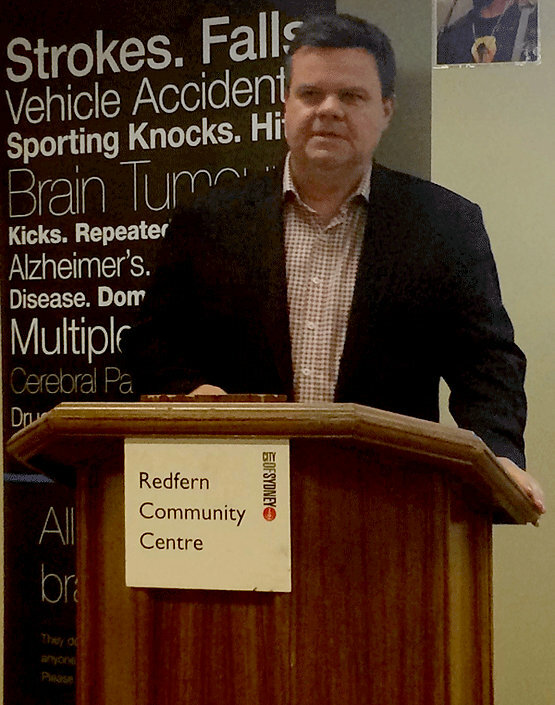 Damian Griffis gave a speech at the Redfern Community Centre on Monday 15 August for Brain Injury Awareness Week 2016. FPDN held an event in partnership with Synapse. This opinion piece was published in First Nations Telegraph.